Currently practising hard for our pre-Christmas gigs - this Saturday (25th) is our first - at 11.30am we are singing a 30 min set at one of our favourite venues - Holy Trinity Church in Nailsea, as part of Nailsea Christmas Fair. We've just sung at a new venue for us - Long Ashton's Apple Day. We have 2 other apple day gigs (see the Event List for details). This is also the month that we switch to practising our winter song repertoire, so it is also a good time to join the choir. Get in touch with Keith for more details. The choir has sung at 3 local wassail events this month, and performed its mummers play. We are now done with winter repertoire for now, and are switching to reviving our summer songs. We start our summer song rehearsal schedule on January 22nd at our usual venue, the Ring O Bells in Nailsea, 6.30-8.30pm. If you were thinking of joining the choir, this month would be a good time to start. Get in touch with Keith to make yourself known. Although we are performing our summer songs up till 5th Nov, we are starting our winter song rehearsal schedule on October 2nd at our usual venue, the Ring O Bells in Nailsea. If you were thinking of joining the choir, this would be a good time to start. Get in touch with Keith to make yourself known. There are 2 wassail events and a private performance in January. After that, the choir starts practising its summer song repertoire, on 31st January. Click the Public Event List link for more details. We will probably not perform for a couple of months, so now is a good time to come along and see if you like singing with the choir! After a very busy September, the choir turns its thoughts to its winter repertoire. After the clocks go back, our practice sessions start at 6.30 at the Ring O'Bells PH in Nailsea. If you are thinking of joining the choir, this would be a good time. Contact Keith to get yourself known and on the mailing list. The choir has one more performance this summer - at the Charles Dickens Conference on 25th July. Then we have a short 'holiday' before preparing for some early September performances. Our winter song practices will start around the beginning of October, so if you are thinking of joining the choir, that would be the best time. Contact Keith to get yourself known and on the mailing list. The choir has just performed its first 2 shows of the summer season, at Upton Folk Festival and at Nailsea May fair. The choir is now practising its summer song repertoire. We will probably not perform for a couple of months, so now is a good time to come along and see if you like singing with the choir! 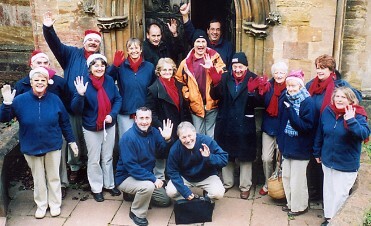 Barley Rye Choir was formed in 2000 as a millennium project of Nailsea Folk Club. The idea was to offer supporters of the club an opportunity to express themselves. In the intervening years, the choir has developed into a supportive group that also makes regular performances. Barley Rye is a community choir - we do not audition, and there is no requirement to be able to read music. We learn songs mostly by ear - both together in practice sessions, or at home, from sound files that we distribute to the group. Most of Barley Rye's songs are folk songs, although we sing some modern songs from a variety of countries, and we have been known to try out pop songs. During the October-December period we concentrate on winter songs, which include folk carols, traditional carols, and wassail songs. We perform these in public and private venues in an intensive period during December and January. In the January-July period we have been concentrating on local folk songs, songs with a summer theme, and 'songs that we sang as children'. We have always taken part in charitable events, but at the beginning of 2010 we decided to choose a charity that we would partner for a year. We started with BRACE, a Bristol-based charity funding research into dementia and Alzheimer's Disease. By the end of the year we had been able to donate a total of £967, as well as raising awareness by talking about BRACE to audiences at our performances, and distributing literature. In 2014 we are supporting Wellspring Counselling, a christian-based organisation offering confidential professional support to North Somerset residents.